Prowler and Carlisle Skid Steer Tires will provide one of the lowest operating costs per hour for off-road use. Manufactured with pure, “All Natural” rubber compounds, beefed up sidewalls and high ply construction, our off-road skid steer tires will provide any contractor, landscaper or farmer the results they need without busting their budget. The Carlisle Skid Steer Tire line will provide the ultimate solution for all your operational needs. The demand for severe duty skid steer tires with low void and deep tread has never been greater. The quality and design of our tires for skid steers will provide excellent traction and mobility while operating at maximum load capacity. The Pro-Flex solid tires are the best solution for working in or around heavy demolition material, eliminating any chance of flats or costly downtime. Skid steer tires need to be puncture resistant to eliminate any downtime and durable enough to provide the longest wear, ultimately lowering the cost per hour. 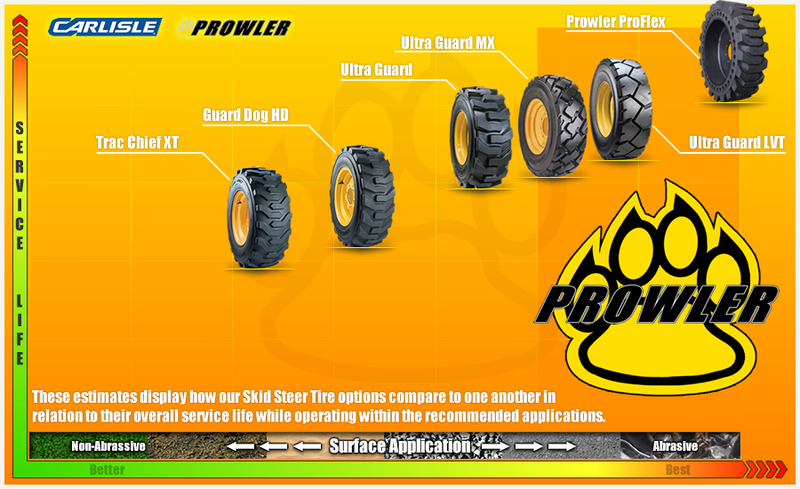 Prowler tires are application specific, so as long as you purchase the right tire for your work environment, you will see the return on your investment rather quickly. If you are not sure what tire would work best for you, please contact us and allow our experienced team assists you in selecting the right tires for your skid steer. Prowler tires are application specific, so purchase the correct tire for your work environment and you will see excellent return on your investment. Feel free to contact us and allow our experienced team to assist you in selecting the appropriate tires for your machine. The surface contact portion of the tire. Important for traction and service life. Contact surface necessary to provide adequate traction. Also known as the tires “Footprint”. Provides the space for the lug to flex as it enters and exits the tires footprint. Low void results in high contact area providing higher traction. The area where the tire contacts with the wheel creating a tight seal. The bead is reinforced with high strength steel cable and/or wires. The section of the tire that runs between the tread and the bead. Supports of the load placed upon the tire. A small portion of the tire that runs between the tread and sidewall. Responsible for preventing excessive stretching of the tire. Used to categorize the performance of tires. 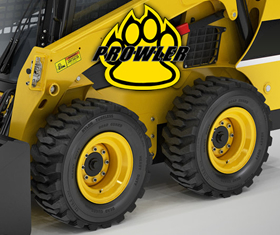 Prowler Tire Seal offers superior puncture protection and allows your Skid Steer to operate in the toughest environments. Recent testing has proven Prowler Tire Seal to be effective up to 1/2″ punctures, compared to the industry standard of 3/8″. Prowler Tire Seal is the only tire sealant on the market that contains Dupont™ Kevlar®, a durable, high tenacity fiber that is 5X stronger than steel and is used in bulletproof vests. When the tire is punctured, thousands of strong interlocking fibers clot in and around the puncture to prevent any loss of air. Prowler Tire Seal has industry-leading rust protection and helps prevent expensive wheel and rim replacements. Prowler Tire Seal is formulated with rust and corrosion inhibitors, as well as a PH buffer that prevents algae build-up, making for easy dismounting and tire replacement. Superior puncture sealing keeps equipment working in the toughest environments. Reduces the risk of flat tires in remote locations and possible downtime. 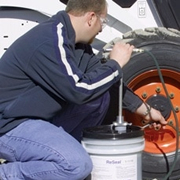 Remains liquid at lower temperatures (-25° F/-32° C), compared to others that freeze as high as 1° F/-17° C.
Protects Skid Steer rims, valve stems, and steel belts against corrosion. We also have Standard and Heavy Duty Skid Steer Wheels that are color matched to you machine’s make, and have the correct offset for your machine’s model. We will pre-mount your tires to the wheels and inflate to the correct tire pressure. They are delivered ready to bolt on and go. We also have a nice selection of over the tire tracks for skid steer loaders. We can provide both steel and rubber OTT tracks that work perfectly with any of our pneumatic tires that have the R4 tread style.